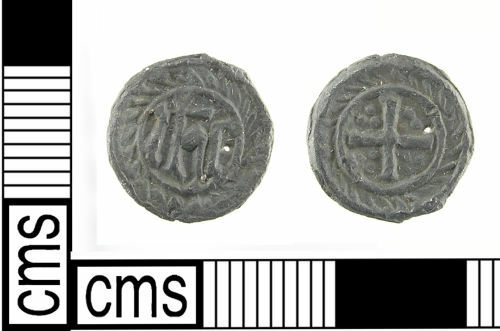 A Medieval – Post Medieval lead alloy token (15th - early 16th century). Cross and Pellets series, London manufacture. Reverse: Cross with three pellets in each quarter inside a linear circle; the whole enclosed with a broad oblique ray border. Rays have the same orientation on obverse and reverse. Dimensions: diameter: 11.82mm; weight: 0.85g. Reference: Mitchiner, M. and Skinner, A. 1984. English Tokens C.1425 – 1672. In Challis, C. and Blackburn, M. The British Numismatic Journal Volume 54 1985. p.94 and 146 no 63. The Cross and Pellets Series of tokens are only known in London and Paris These tokens have been found associated with coins of Henry VI through to Henry VII and it is thought production ended in 1490 but the continued in circulation into the 16th century. All London examples have the rays orientated in the same direction on the obverse and reverse, the Paris examples show different orientations (Mitchiner & Skinner 1984:94). John Clark: IHC = first three letters of Jesus in Greek Iota-Eta-Sigma. In the Medieval period this changed to be a Latin abbreviation for Jesus Homine Salvator – Jesus Saviour of Mankind. In black lettering the H changed from the capital to the lower case with a cross through the upright. John Clark Senior Medieval Curator, Museum of London. Obverse inscription: Complete Post Medieval cast lead alloy token (1500-1700 AD).